They're not expensive at Aldi, so why bother making them myself? Frugal cooking means looking beyond the price per unit. I only save about 60 cents off the cost of storebought, but I get a superior product for my efforts. I can make graham crackers higher-fiber (using whole wheat alone) and lower sugar (using higher quality natural sweeteners). They taste fresher, too. Tonight I'm testing recipes from Martha's Family Cookery Book (my best Christmas gift) and Cookin' With Home Storage. Both offer excellent ideas for scratch cooking even the most basic snacks. We like to try recipes like this just for the novelty of the thing. Unless you find a recipe and try it out, how would you ever know you could make your own graham crackers, english muffins, or bagels? I can't wait for your series. Really, it is the little things that help. I could not believe how much I save (and how much fun I have) by making my own yogurt. (and I started doing that when I was a super busy grad student. Now that I stay home, I can do so much more!) I've never tried graham crackers, but I've made my own wheat thins for awhile now, when we want crackers. I have been really impressed by your blog. I read it every day. Meredith, Thank you for posting the Behind The Scenes. I know that I can gleam a wealth of information,tips,and advice from your website blog. Thank you from one very greatful reader and learner of your blog. 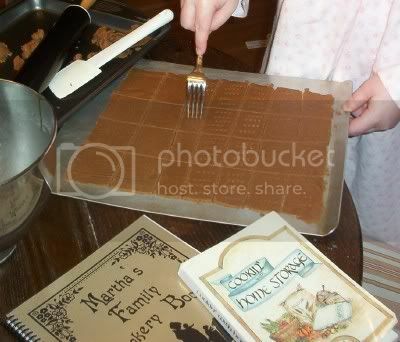 I got Martha's Family Cookery Book recently as well, and I really like it. I enjoy making things from scratch, and I do think that even if it doesn't save money up front, it makes for a healthier and more tasty item. Plus it's fun to do with the kids. Meredith, i think you would get just as excited about frugal cooking find I made yesterday at TJMaxx. Before Christmas we attended a coffee party, hosted by coffee enthusiasts featuring French press, Turkish, espresso, etc. I very much wanted an espresso machine after! Pricing, out of my range. Yesterday, snagged for mega-clearanced $3.00, an All-Clad, caterer's grade, manual espresso machine. BEAUTIFUL! Will be trying it soon. I've also ordered Martha's Family Cookery Book with my Christmas $$ too, based on your recommendation.